It’s a job James Pittman, RN, MSN, knows well. The current chair of the OPTN Transplant Administrators Committee began his work in transplant administration at the former Methodist Hospital in Houston (now Houston Methodist at Texas Medical Center). Today, he serves as Assistant Vice President of Transplant Services for Nashville-based HCA Healthcare, which comprises 185 hospitals in the U.S., including 13 transplant centers across the country. “But I’ve always been in transplant, since the beginning when I was at the bedside.” After graduating from nursing school at the University of Texas at Austin, he started out in the ICU, where he cared for heart and lung transplant recipients. When he gives remarks at the TMF opening welcome session this year, Pittman will be speaking to a broad community of thought leaders in the field at what he describes as the preeminent education event for transplant administration. 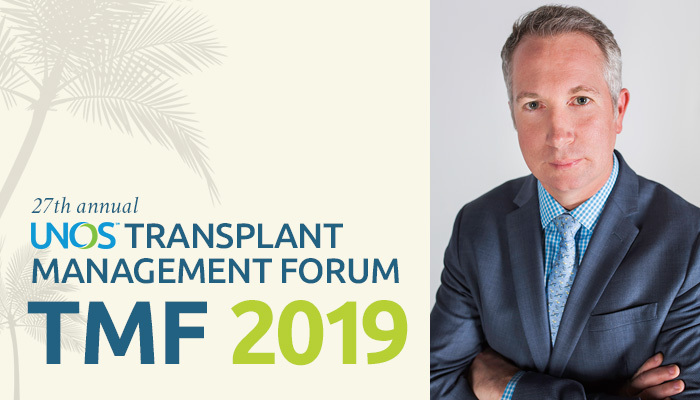 Connect with James Pittman and other transplant administration leaders at the 27th Annual UNOS Transplant Management Forum in Orlando, May 14-16, 2019. TAC considers issues related to the administration of transplant programs and provides input to the other Committees and the Board with regard to the potential impact of developing policies and other OPTN requirements on transplant program operations. Find out more about the committee here.